Check out the top 7 reasons NOT to renew Commvault and switch to Veeam today! 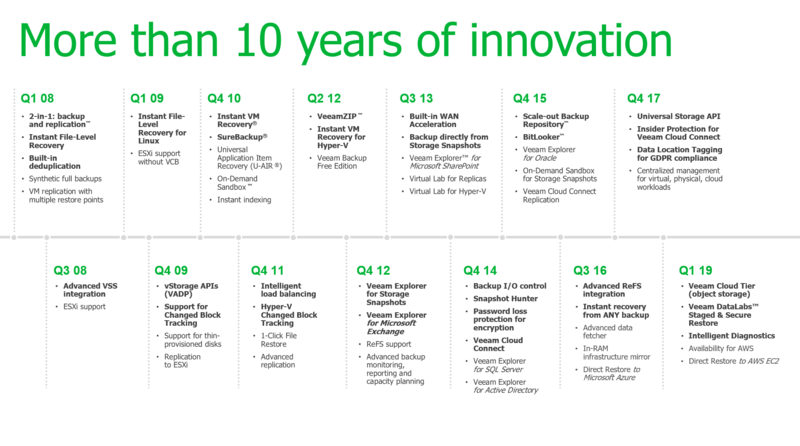 Veeam is one of the fastest growing enterprise software companies today It is a privately held shooting star on target to reach $1 billion in yearly sales by 2018 with and all the freedom to innovate. Recognized by IDC and Ovum as a top choice among data protection and Availability solutions, Veeam’s forward momentum is unparalleled. Veeam’s growth shows no signs of slowing down adding more than 4,000 new customers every month. “Veeam customers have always told us “It just works.” That’s because they report fewer backup and replication failures and substantially less downtime than with legacy backup solutions. This is the #1 reason enterprises select Veeam! Veeam will help you sleep better at night, through our industry-leading customer support, patented automated backup and replica testing and recovery verification for 100% of your workloads. Nine out of 10 Veeam customers WOULD recommend Veeam to their peers with a Net Promoter Score (NPS) of double the industry average. Indeed, Veeam’s customers are overwhelmingly satisfied with our ease of use, product features and functionality, technical support and sales effectiveness. Over 50,000 companies switched to Veeam in the last 12 months – many from Commvault! Veeam may request proof of ownership of a competitive product. This Promotional Offer is available for a limited time only and is non-repeatable. This Offer ends on December 31, 2018.